Henrietta Lacks: Immortal yet forgotten – That's Interesting! This is a story about a woman named Henrietta. 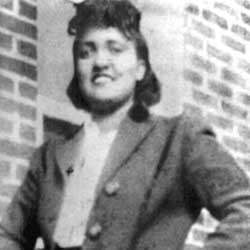 Henrietta Lacks. Henrietta was born in Virginia in 1920. She grew up on a struggling tobacco farm, living in the same building where her great-grandparents had lived as slaves years earlier. In 1951 Just 4 months after giving birth to her fifth child, Henrietta was diagnosed with cervical cancer. Meanwhile, scientists had been trying, and failing, for years to successfully grow human cells in the lab. This would allow scientists to study cells much more easily, to compare different cell types and even test the effects of new drugs. The problem was that normal cells will die a couple of weeks after you take them out of a human, so they needed a new approach. Before we go any further, I just need to introduce cancer a little. Cancer cells are like cells 2.0. They are just much better than our normal cells at surviving. They are like those TV adverts you see for the royal marines: Run faster, fight harder, live longer… Be the best! They are the best. Therefore, scientists thought maybe there is a chance that these would grow in the lab. One cell biologist named George Gey, decided to get his hands on as many cancer cells as possible and one of his patients was Henrietta Lacks. He cut a tiny sliver off her tumour sent it to the lab to be grown. He never asked for Henrietta’s consent to take her cells and he never checked with her family either. That wasn’t how they did things in the 1950s. What happened next was simply amazing. Henrietta’s cells grew. And grew. And continued to grow. Nobody had ever seen anything like it. They were sent to labs all over the world. A factory was built to produce trillions of cells a day. Yet still Henrietta’s family knew nothing about them. The cancer killed Henrietta shortly after her cells were taken. She was 31. Named HeLa, after the first 2 letters of her first and surnames, Henrietta Lacks’ cells are still growing today. They are present in almost every biology lab in the world, including mine. They have led to massive advances in cell biology, the understanding and treatment of cancer and the development of many drugs and vaccines, including the polio vaccine. All of this research went on without The Lacks family knowing anything about it. It wasn’t until 22 years after her death that they were informed that Henrietta’s cells had been taken. Furthermore, they were only told because scientists came to take blood samples from Henrietta’s children under the implication that they were testing to see whether they were at risk of getting the same cancer that had killed their mother. In fact, they were searching for genetic markers, unique symbols in their DNA, which were specific for the Lacks family; in order to better understand the cells themselves. Parts of their DNA were sequenced without their knowledge and the results, their own personal private information, was published to the wider scientific community. However, there is now some good news. With the advancement of DNA sequencing technology, Henrietta Lacks’ genome (all of her DNA) has now been sequenced. This has led to an unprecedented agreement between Henrietta’s family and the National Institutes of Health (NIH), which hopefully means that the case can be put to bed. The agreement states that only certain researchers can have access to Henrietta’s genetic sequence, and each application must be reviewed by a panel, which includes two members of the Lacks family. It only took 62 years for the family to get this recognition that they deserve. In my opinion, the only remaining issue is that so few people have ever actually heard of Henrietta Lacks. Her cells have contributed a huge amount to biology and saved millions of lives, yet she is known worldwide by an acronym, HeLa, rather than by her actual name. Henrietta. To learn more about this incredible scientific story, and in particular the family who lie at its centre, I highly recommend reading The Immortal Life Of Henrietta Lacks by Rebecca Skloot. I performed this story as part of the FameLab UK (famelab.org/uk) regional heats. If you don’t want to read the story and would prefer to see me tell it, then watch the video below. Thanks! Hi Alison, thanks very much! Regarding ownership, it is now written law that a person does not own the rights to their tissue once it has been taken; however, they must give permission for it to be taken in the first place and can decided what can/can’t be done with it! They just can’t benefit financially from donating it. A statue would be great, and to be honest, just some wider appreciation from the scientific community would go a long way! Thanks Ben. Funnily enough I just heard about HL last week for the first time, when a friend of Harriet’s, who is doing a PhD at UCL, mentioned the source of the cells he was working on. My first reaction was to wonder why this woman is not better known, given her immense significance. Perhaps now is the time to start lobbying for a statue? I suppose the real issue is where it should be sited, given her global reach. By the way, your headline is genius – I love ‘immortal yet forgotten’. I will mention this on Twitter.